On August 14, 2018 a Kingsport resident reported that she believes that she lost her debit card in the parking lot of Zoomerz, located at 1643 Fort Henry Drive in Kingsport. She soon learned that her debit card had been utilized by an unknown individual to make no less than seven fraudulent charges on her account. 1) Dollar General located at 5215 Memorial Blvd. 2) McDonald’s located at 214 Carolina Pottery Dr.
3) Greenwood Market located at 5121 Memorial Blvd. 4) Lowe’s located at 2526 East Stone Dr.
5) M&M Mart located at 1571 North Eastman Rd. 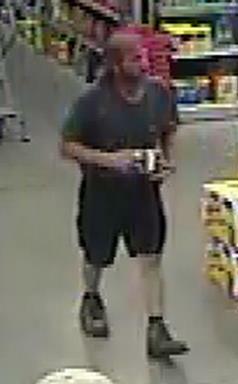 A white male adult suspect was captured on video surveillance during the transaction at Lowe’s. A photograph of the suspect taken from that footage has been included in this release. Anyone who recognizes him is asked to contact Detectives in the K.P.D. Criminal Investigations Division at 423-229-9429 or call Kingsport Central Dispatch at 423-246-9111.